What’s shakin’? Welcome to the very first episode of the Shake Up Learning Show, where we’ll dig into integrating technology into the classroom, growing as a leader, refining your instructional strategies, and transforming your classroom! Each episode of this new podcast will be packed full of practical ideas, insights, and the opportunity to learn alongside students and other teachers. I’m your host, Kasey Bell. In case we haven’t connected before (maybe on my other podcast, Google Teacher Tribe), let me introduce myself! I’m a former middle school teacher turned digital learning coach, as well as an international speaker, consultant, blogger, author, and—of course—podcaster! My mission is to help teachers learn to meaningfully integrate technology in the classroom. Today’s 20 tips are in a specific order, starting with shifting your mindset. You need to make up your mind to be positive, even though the classroom is full of obstacles. Without getting your mind into the right place, it’s so much harder to follow through with the rest of the tips that I’ll cover in today’s episode. From there, we’ll move onto my other top tips, including taking risks, starting with the “why” instead of the technology, getting tech into your students’ hands, and not getting swept away by new tools. And that’s just the beginning! My hope is that these 20 tips will guide you in successfully implementing technology in your classroom in a way that works for you and your students. [00:28] - Kasey welcomes listeners to the show and introduces herself. [01:42] - Today’s show will be about one of Kasey’s favorite topics: tech tips for teachers! [02:23] - Kasey gives a quick shoutout to Lauren Billingsley, who sketched her entire Dynamic Learning Workshop at TCEA. [03:19] - We learn about the podcast, and what to expect from future episodes. [08:17] - Kasey jumps into talking about the top 20 tech tips for teachers, exploring the first two tips: shift your mindset and take risks. [14:43] - The third tip is to start with the “why,” Kasey explains. Tip #4 is to get the tech into your students’ hands. [18:05] - Kasey’s fifth and sixth tips are to shop for tools like you’re on Amazon, and to avoid getting swept away by new tools. [20:53] - Be consistent, Kasey advises as part of tip #7. Her eighth tip is related: don’t integrate too many tools at once! [23:01] - The ninth tip is one of Kasey’s favorites: don’t be afraid to let your students teach you! Also, utilize student tech experts (that’s tip #10). [26:09] - Do your students come to you with every single tiny question? If so, implement the “ask three before me” strategy. [27:18] - Tips #12 and 13 are both specifically about using tools. [30:40] - Kasey’s 14th tip is to give students voice and choice, she explains. [32:18] - We learn about the importance of getting organized in tip #15. The sixteenth is related, and involves packaging your online assignments. [35:41] - Tip #17 involves not assessing the bells and whistles, in favor of assessing content and skills. [37:32] - Kasey explores her 18th tip, which is to publish for a global audience. [39:20] - The 19th tip is to always have a plan B, Kasey explains. [40:59] - We hear the 20th tip, which is to share your voice. We also need to cultivate this in students, Kasey points out. [42:45] - Kasey explains how to get your freebie, which you can find at this link! [43:57] - Kasey’s podcast question of the week is this: which of the 20 tips stood out to you? Pick three that you plan to take action on, and explain how. Post your answer on The Shake Up Learning Community or your favorite social media platform! [45:24] - We hear about what’s new on the Shake Up Learning blog. 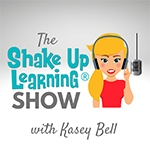 [46:26] - Kasey leaves listeners with a challenge of the week: download the freebie, share this episode with at least one other listener, and join the Shake Up Learning Book Study! Join the Shake Up Learning Book Study! Google Teacher Tribe episode 18: Google Slides Can Do What?!? !